Are you House Whalley? House Cloverdale? House Newton? The City of Surrey celebrated the start of the eighth and final season of the HBO hit "Game of Thrones" with its own take on the series. 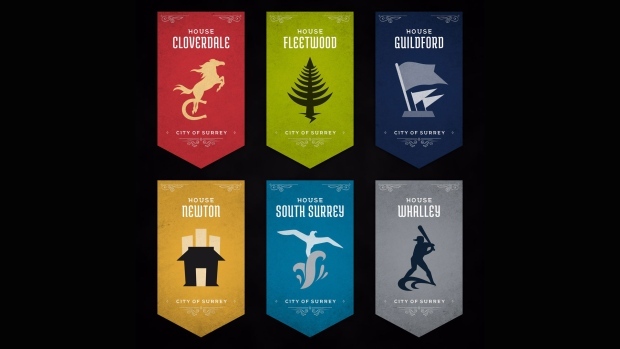 In a series of social media posts, the city posted banners representing its six houses: Cloverdale, Fleetwood, Guildford, Newton, South Surrey and Whalley. Each banner got its own symbol, ranging from a seagull rising from the water – South Surrey – to a series of flags, referencing the massive Canadian flag over a car dealership. "Rally the realm and raise your banners!" the city wrote on Twitter. In individual posts with each banner, the city worked in more references. "Rodeo is coming," said the post for Cloverdale, a reference to the GoT refrain that "Winter is coming." "King's Landing of Surrey," the city said of Whalley.